Photocopy and transcription of company registration documents. Interpretations for cases of questionable name and business scopes for companies, businesses, or limited partnerships; and proposal of the laws and regulations. Addition (revision) and announcement of List of Codes of Business Items of Companies, Firms, and Limited Partnerships. Revision and Interpretation of the Business Entity Accounting Act. Anti-money laundering and countering the financing of terrorism for jewelry retail businesses. Formulation (Revision) of the criteria of classification of commercial groups. Deliberation, amendment, and interpretation of Electronic Game Arcade Business Regulation Act as well as the relevant regulations; and electronic game console review operation. Management of special purpose businesses such as ballroom and computer recreational activities, etc. Proposal, interpretation, and consultation of the Commodity Labeling Act and the Labeling Criteria for specific products. Responsible for the standard contracts under the jurisdiction of the Department of Commerce and relevant consumer protection services of this Ministry. Development, construction, and maintenance of the national administrative information system. Construct, maintain, and operate the Certificate Authority; and issue industrial and commercial certificates. Deliberation, amendment, and interpretation of the Business Registration Act. Deliberation, amendment, and interpretation of the Company Act. Deliberation, amendment, and interpretation of the Business Mergers and Acquisitions Act. Deliberation, amendment, and interpretation of the Limited Partnership Act. Facilitate the development of domestic and cross-border e-commerce. Promote high quality smart business services. Promote international and technological development in logistics. Facilitate the development of the food and beverage industry in Taiwan. Promote innovation and research & development of the service industry. Responsible for assisting with century-old and sixty-year-old stores. Upgrade the life service industry and the franchise industry. Recommend mixed industrial and commercial district applications to stimulate business environments. Promote the internationalization of the commercial design industry and the advertising services industry. Process preferential loans for distribution services and food and beverage services. Planning and promoting commercial policy. 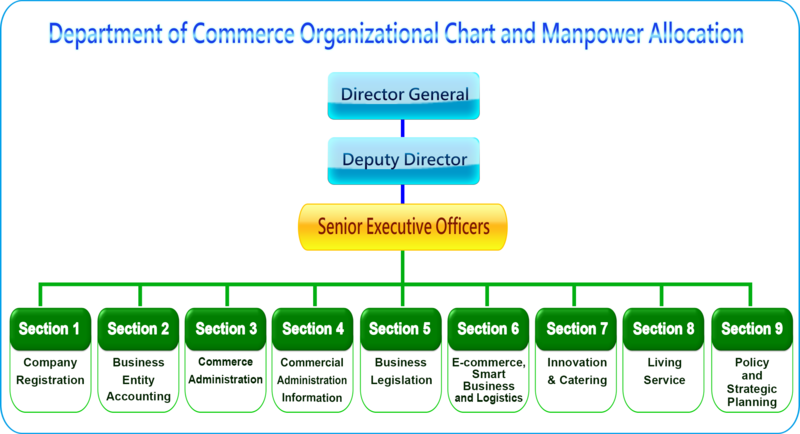 Planning and promotion of personnel, training, and organization. Budget provisions as well as accounts audit and control. Official documents receiving, sending, auditing, filing and supervision of related operations. Approval, change, and annual audit of institutions engaged in economic activities.